Ally Love returned to Galabank and scored the decisive 55th minute goal which ended Annan’s impressive unbeaten league run. It was a fine match played in wet miserable conditions but both teams produced a thrilling encounter with the result in doubt up until the final whistle with Clyde lifting the points. Annan boss Peter Murphy was forced again to make changes with injuries ruling out Alex Mitchell and Steven Swinglehurst and with Owen Moxon suspended for a booking he picked up Playing for Queen of the South in a Scottish Youth Cup match two years ago. The game started well for Clyde and they went ahead after only 10 minutes. The goal carried a little fortune with the through ball to David Goodwillie being helped on its way by a deflection which fell kindly for the striker who collected the ball and finished clinically after rounding the advancing Jonny Jamieson. It was the perfect start for the visitors who almost doubled their lead in the 20th minute after Barry Cuddihy delivered an inviting cross ball aimed for Goodwillie but Scott Hooper averted the danger with a well timed tackle on the Clyde striker. Kevin Nicoll was lucky to receive only a yellow card for a crude tackle on Aidan Smith which also resulted in Ayrton Sonkur being yellow carded . 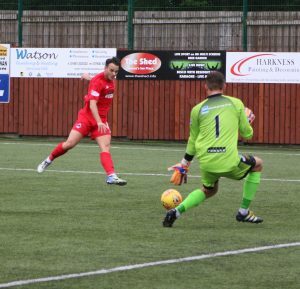 Jamieson then pulled off an important save to deny Ally Love who was one on one with the Annan keeper after the defence were caught on the turn. Annan started to push for the equaliser and it came in the 36th minute following an impressive run from Chris Johnstone who cut in from the wing across the face of the penalty box before laying the ball off to Tony Wallace who finished with a low shot into the corner of the net. The game was finely balanced and Annan had to rely once again on Jamieson who denied Goodwillie with an important save. Annan responded at the other end when they were rewarded with a free kick 25 yards out but this time there was to be no repeat of last week as David Wilsons effort failed to hit the target. Annan started the second half well when Chris Johnston finished a good run with a shot but never really tested Blair Currie. Clyde then struck again in the 55th minute after Ally Love connected with a low cross swung in form the right to finish with a low strike which beat Jamieson low down at his left hand post. Ross Fergusson was introduced at the expense of Aidan Smith in the 61st minute. Chris Johnston was then at the heart of another dangerous move as Annan tried to prize open Clyde’s well organised defence finishing with a shot into the arms of Currie. Max Wright was introduced at the same time as Ally Love was replaced in the 77th minute, Mark Lamont tried his luck with a fine shot which went narrowly over the bar. Annan finished the half with a couple of free kicks which ended with Tommy Muir slipping the ball wide of the target. Annan – John Jamieson, Scott Hooper, James Creaney, David Wilson, Peter Watson, Ayrton Sonkur , Chris Johnston , Ryan Sinnamon, Aidan Smith ( Ross Fergusson 61 min), Tommy Muir, Tony Wallace (Max Wright 77 min ) Subs not used Robbie Minto, Scott Roberts, Peter Murphy. Clyde –Blair Currie, Barry Cuddihy, Ray Grant, Scott Rumsby, Martin McNiff, Mark Lamont (Trialist 88 min), John Rankin, David Goodwillie, Chris McStay, Ally Love (Trialist 77 min),Kevin Nicoll. Subs not used Kieran Hughes GK, Keiran Duffie, Joe Gorman, Dylan Cogill. Referee – Peter Stuart Assistants – Stuart Stevenson and Ryan Lee. It was a day when Edinburgh City went to the top of the league after Blair Henderson scored the only goal of the match against top of the table Peterhead. Queens Park and Cowdenbeath had to be content with a share of the points in a 0-0 draw at Hampden. Stirling Albion surprisingly defeated Elgin City 3-0 with all the goals coming in the opening half. Berwick Rangers lifted the points against bottom side Albion Rovers with a 5-3 victory .